Rumors about the possible acquisition of Facebook, usually with Yahoo as buyer, have been around for most of this year. Not that Yahoo or Facebook have asked for this attention, but the media is getting antsy. Robert Young put it best last week when he asked – Yahoo & Facebook: Deal or No Deal?. That is certainly the question of the fiscal quarter. We know that Facebook has been pursued almost since the beginning of its existence. They narrowly avoided a $10 million acquisition by Friendster in mid 2004, just months before they took their first round of financing from Accel Partners. Former Friendster execs say that the deal was close to closing, but last minute negoations over control ultimately disrupted the deal. Since then, Facebook has certainly been approached by every major Internet company. At Yahoo, the long running courtship has lasted at least as long as this year, and is internally referred to as “Project Fraternity.” Leaked documents in our possession state that an early offer was $37.5 million for 5% of the company (a $750 million valuation) back in Q1 2006. This was rejected by Facebook. Things really heated up mid year. 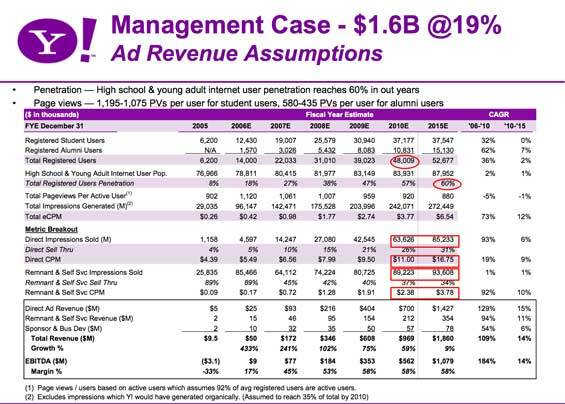 Yahoo proposed a $1 billion flat out acquisition price based on a model they created where they projected $608 million in Facebook revenue by 2009, growing to $969 million in 2010. By 2015 Yahoo projects that Facebook would generate nearly $1 billion in annual profit. The actual 2006 number appears to be around $50 million in revenue, or nearly $1 million per week. These revenue projections are based on robust user growth. By 2010, Yahoo assumes Facebook would hit 48 million users, out of a total combined highschool and young adult population of 83 million. Our sources say that Facebook flatly rejected the $1 billion offer, looking for far more. Yahoo was prepared to pay up to $1.62 billion, but negotiations broke off before the offer could be made. These documents are now a couple of months old, and both Yahoo and Facebook may have changed their views on a possible deal substantially in that time.